Inspiration: Heading to NYC and Blogfest 2012! It doesn’t get any better than a trip to New York in the Spring. My favorite thing to do: Long walks in Central Park. Beautiful. And shopping. Museums. Just being in NYC. But this coming week (May 21-23) will be an exciting, extra-special NYC adventure and I am counting the days! I am so fortunate to have been included in Blogfest 2012, a three-day tour planned exclusively for interior design bloggers that features the industry's top shelter magazines, A-list design celebrities and breathtaking venues. Sponsored by Kravet, Lee Jofa, and Brunschwig Fils, it is jam-packed from morning until night with design events that have my head spinning! Jennifer Powell, Kravet’s social media wiz and overall amazing person, assures us that there are surprises around every turn and guarantees that we will experience the very best of interior design in NYC. I have my running shoes ready to go!! An added bonus: I will finally have the opportunity to meet some of my favorite designer/bloggers that I have communicated with via social media. And my friend and Houston designer Pamela O’Brien of Room Redo and I will be going a day early because after all, a girl must have some fun time in NYC. A small sampling of Blogfest includes the event’s kickoff on Monday afternoon with Architectural Digest Editor-in-Chief Margaret Russell at the Kips Bay Decorator Show House. Widely regarded as one of the most prestigious interior design show houses, Kips Bay will take place in two penthouse apartments at the Aldyn, a luxury building on Manhattan’s West Side. So exciting! Then it’s on to a cocktail party hosted by Savant at its 8,000+ square foot Experience Center. The space, located in the heart of SoHo and was designed by guest of honor, Thom Filicia and Thom Filicia. features Savant’s Apple-based control and automation technology that is merged seamlessly in the stylish rooms settings. By this time of night, it is appropriate that we end up where there are plenty of beds! Though in existence since 1905 when Savoir Beds was started by London's Savoy Hotel, it is only recently that the brand has found itself outside of its hometown and making its mark with designers globally. We will be a part of discovering the 107-year-old “new” luxury brand at an after party at the Soho showroom. On Tuesday morning, we head for iconic Hearst Tower to meet with some of my favorite design magazines. 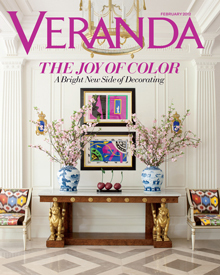 Editor-in-Chief Dara Caponigro will bring to life Veranda's May/June issue, offering a behind-the-scenes glimpse with the help of two top designers featured in the issue: Timothy Whealon and Darryl Carter. House Beautiful’s Editor-in-Chief, Newell Turner will share examples of submissions for publication that struck that perfect note – creating the a-ha moment of "This is a story we need to look into." Joining Newell will be three of House Beautiful’s Next Wave Designers: Jon Call, Jill Goldberg, and Michael Herold. Traditional Home Editor-in-Chief Ann Maine will host us in the Kravet showroom for an insightful and in-depth interview with Alexa Hampton,one of my favorite designers that I had the privilege of meeting not long ago. The talented designer at the helm of Mark Hampton LLC and the creator of several successful Kravet fabric collections, she joins Hampton to discuss what "traditional" means in today’s market and how it has changed to reflect the current state of the industry. There is so much more: Baccarat; the GE Monogram Design Center; a behind-the-scenes glimpse into the world of fabric design, product development and showroom merchandising; Color Pulse® 2013 with John Turner, leading color expert and trend analyst with Benjamin Moore and Company; a tour of the Elle Decor Modern Life Concept House with Editor-in-Chief Michael Boodro. Busy days and lots of great information! But I will stop now and rest up in preparation for my design adventure in NYC. Check back for blogs from NYC! Want to turn plain rooms into Spectacular Spaces? I can help. Contact me!